Saturday, September 10: 8 a.m. to 3 p.m.
Over 60 artists will be creating sidewalk art on 5th Street this coming Saturday. 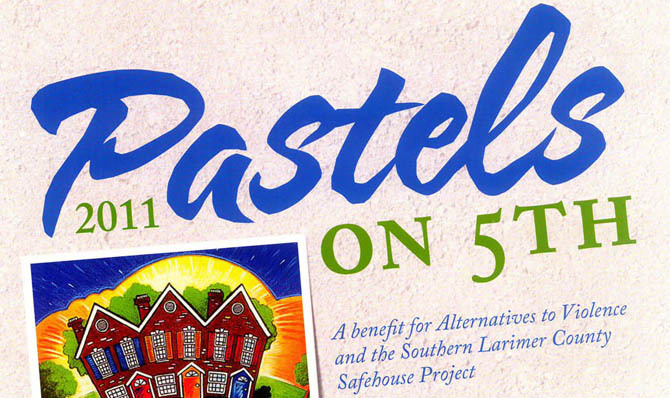 This first of its kind event in this area is a fundraiser for the Alternatives to Violence (ATV) Safehouse project. The sidewalks on both sides of 5th Street between Lincoln and Cleveland Avenues will be the canvasses for Pastel drawings. Come see the artists working and enjoy the music from the stage at the Loveland Museum/Gallery. Food venders will be along Lincoln Avenue and there is even a place for children to draw. Stop anytime to view the work and even vote for your favorite art. ATV’s mission is to assist families in crisis because of domestic violence. Often those families need a safe place to go to escape an abusive situation. Presently, there is now place in southern Larimer County to house. The goal is to build a dedicated facility in Loveland where families can be safe. The plans have been completed and with the support of Loveland Habitat for Humanity and Leadership Loveland, ATV hopes to begin construction in the near future. You can stop by the ATV information booth and learn more. Site contents copyright © 2019 Recorder Online	except as noted. All rights reserved. | 96 queries in 2.428 seconds.